I have failed this cake numerous times. 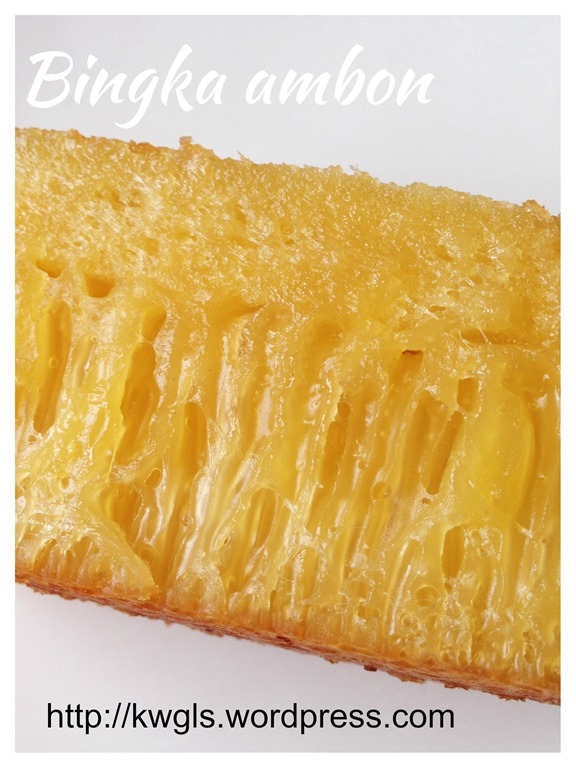 It is not surprising as most bloggers and home bakers seem to have failed too. At time, it does not seem to form the require hole in the cake. If there is no hole in the cake, the cake will become a bit mushy and not springy as what it is supposed to be. 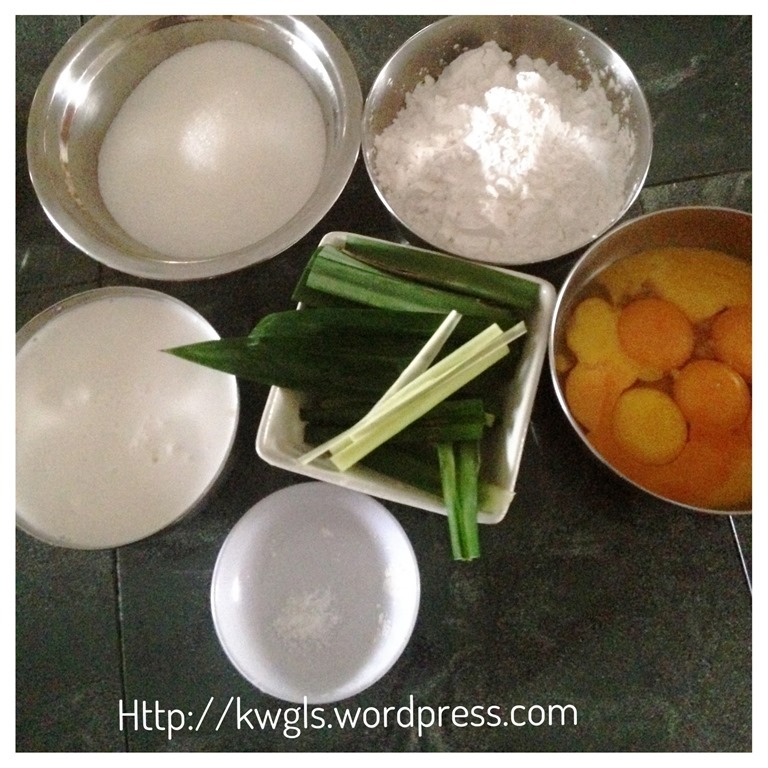 After trying a few recipes, I have decided to try a recipe not form any famous blogger but a rather standard recipe sharing platform based in Australia. With only a simple picture but with rather clear instructions, I have decided to try for my 4th time yesterday. Though not 100% successful, but I am still very please and decide to issue the recipe and let the readers try out the recipe. 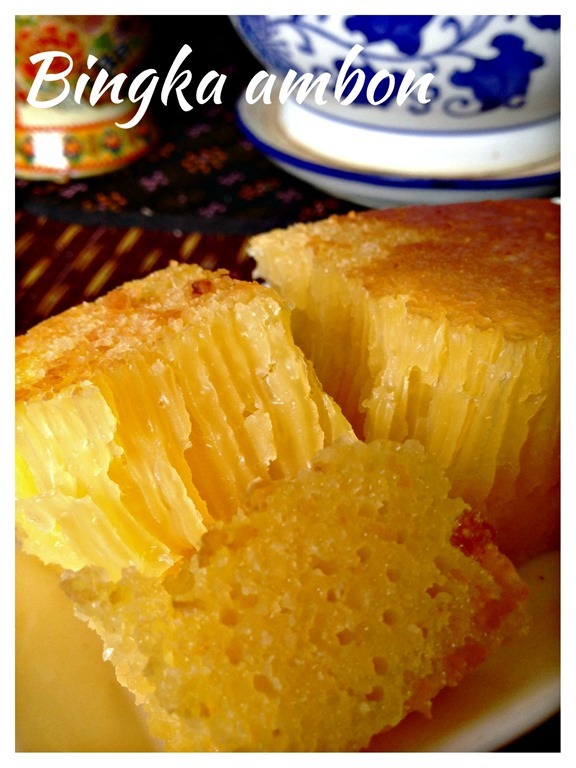 About 90% of the cake are with honey comb structure, in addition, it is springy with taste almost similar to those sold in the famous Bengawan Solo in Singapore. I roughly knew the reasons of no holes forming in the top part of the cake, it is the temperature control. Instead of using the bottom heat for the first 20 minutes (not indicated in the original recipe), I have use the top and bottom heat for the whole cake. Since the top part of the cake had been cooked, the bottom part of the cake can’t push the hole up to the top part causing what is it like in this cake. I will adjust my steps in the recipe. 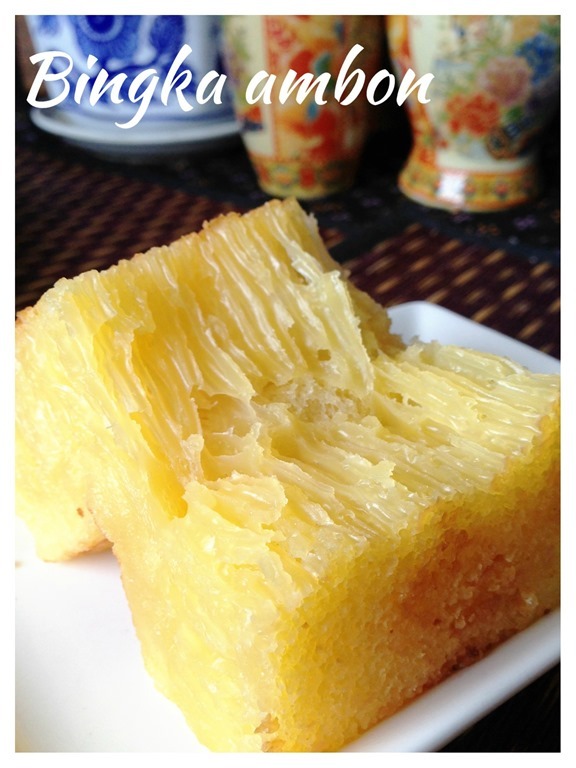 Bika Ambon or Bingka Ambon appeared to be one of the common hand gifts from Indonesian who visited Singapore and Malaysia. 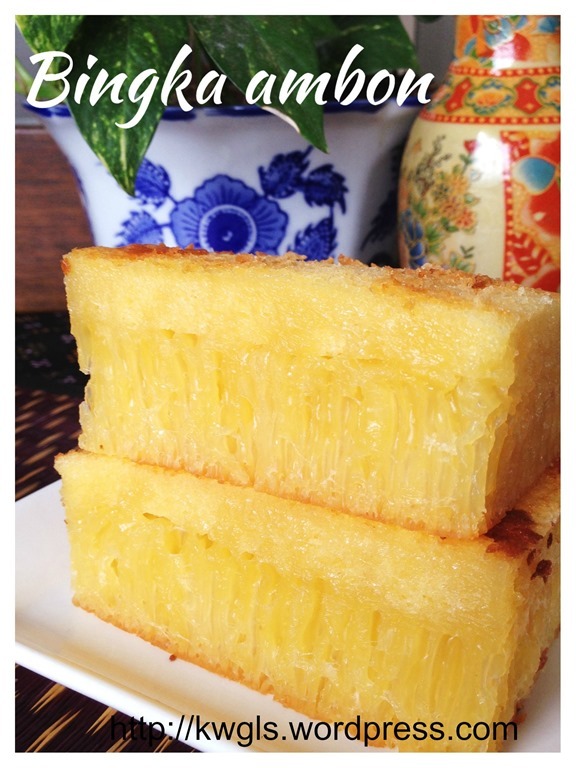 I have my fair share of Bika Ambon when I am dealing with my ex-Indonesian colleagues. 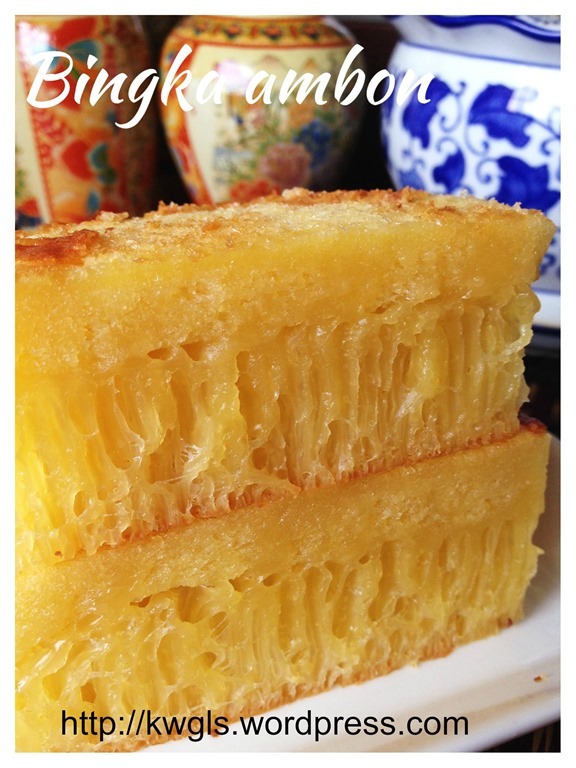 They will brought us a cake of bika Ambon when they visited Singapore and me and my colleagues like the cake for its rich, buttery aroma and a rather special springy texture. Lightly grease a 8” square baking tin. You can line the bottom with a piece of parchment paper to facilitate taking out the cake later. 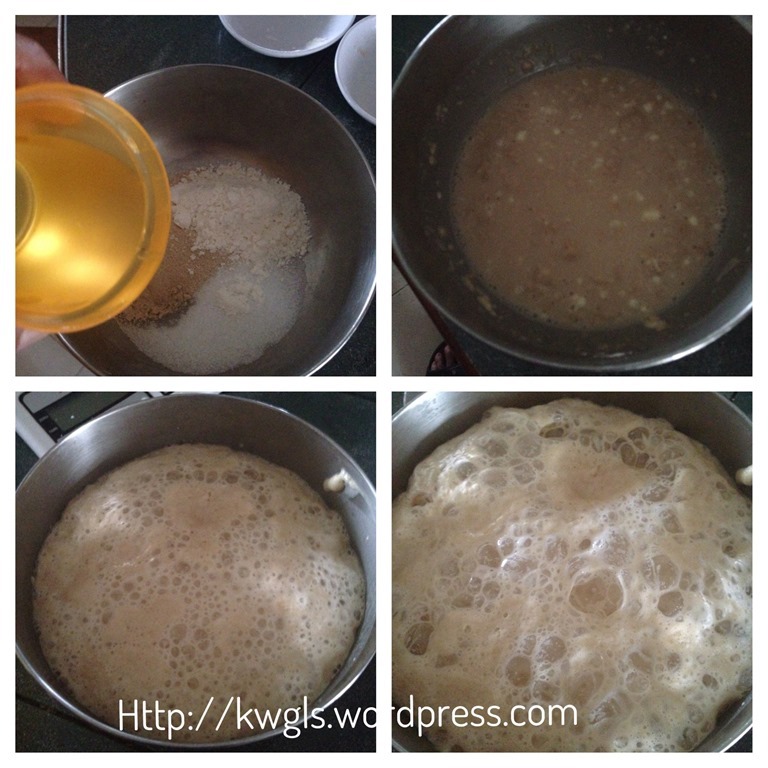 To prepare the starter dough, mix all the starter dough ingredients together. Let it sit in the room temperature for about 15 minutes. At the end of the 15 minutes, you will witness a lot bubbles or frothing being formed. 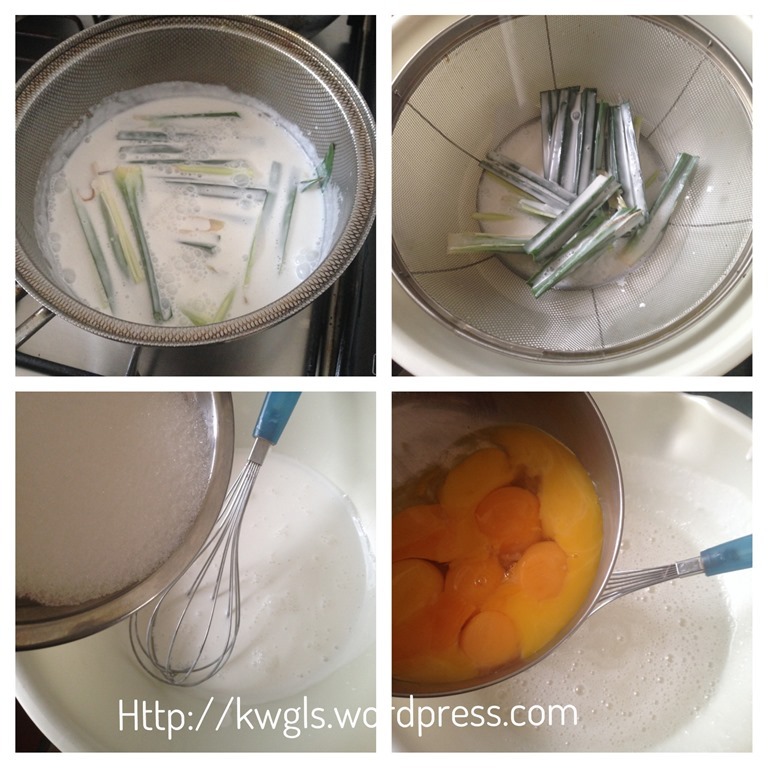 Meanwhile, boil the coconut milk under low to medium heat together with the Pandan leaves, citrus leaves and lemon grass. 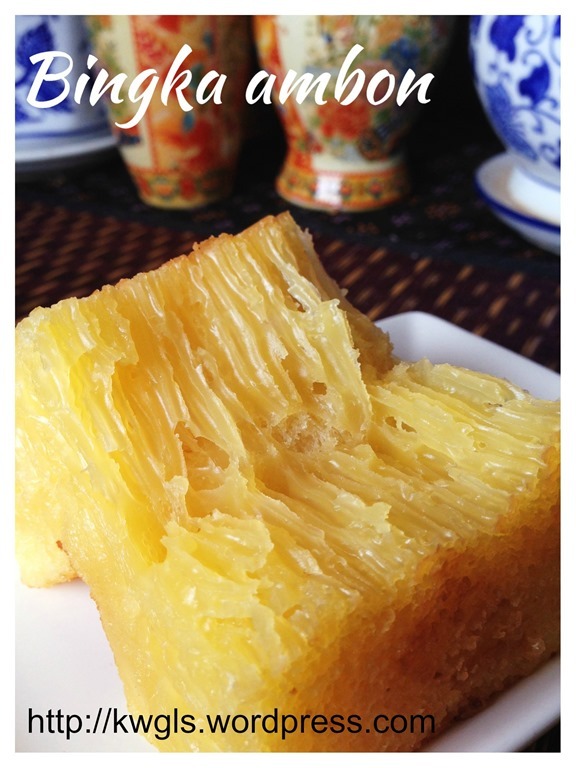 Once boiled, take out, let it cooled a bit, add sugar and egg yolk, beat until it is light and well combined. 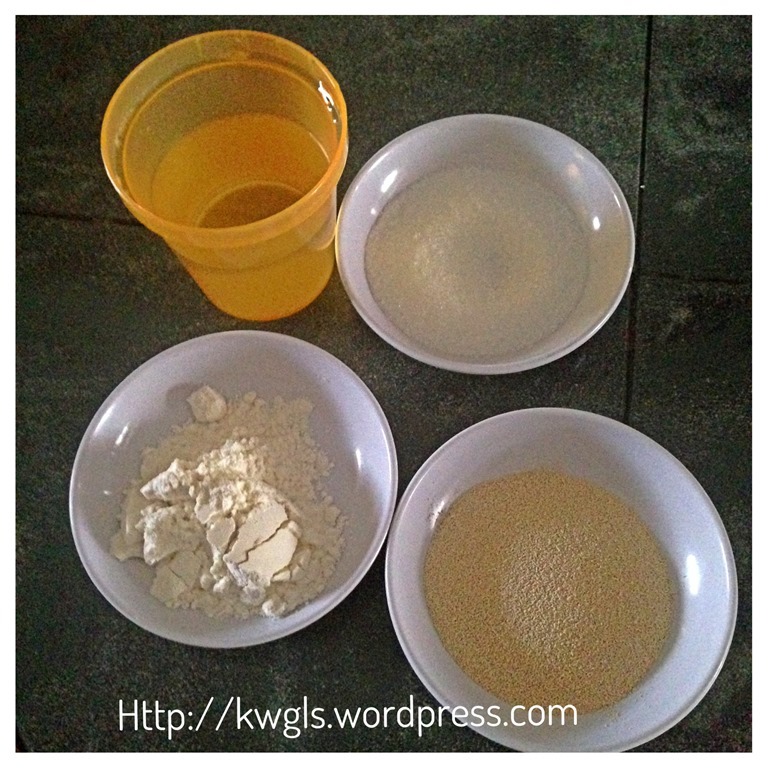 Add the tapioca flour and beat until well combined. Just to counter ensure that the temperature is not too hot, touch the bowl and ensure that it is lukewarm before adding the starter dough. Add the starter dough, beat until well combined. Let it proof for 2-3 hours. 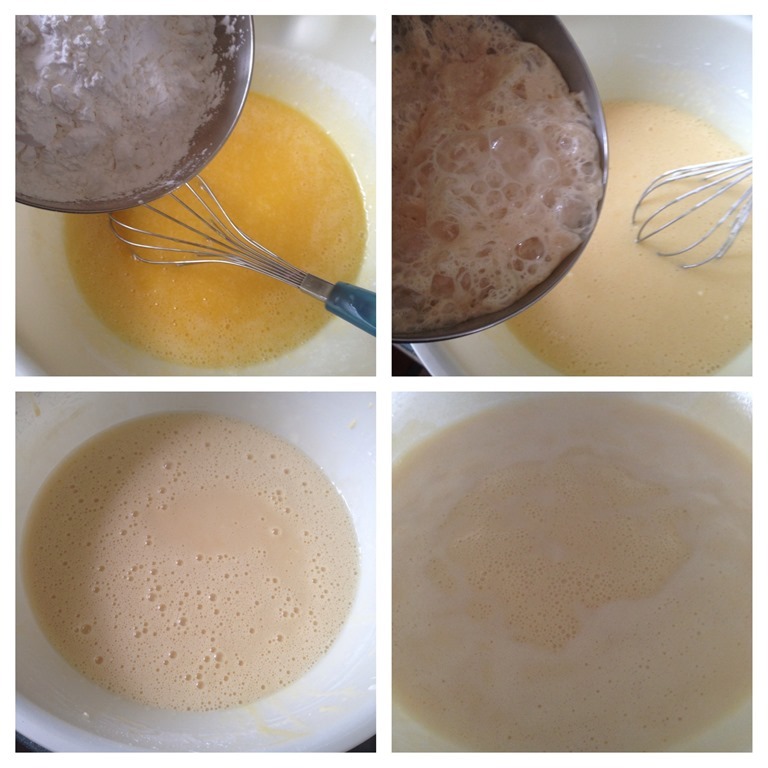 After 2-3 hours, you should be able to witness the batter become stickier with lots of bubbles being form. Pre-heat the oven to 160 degree Celsius with BOTTOM HEAT ONLY. 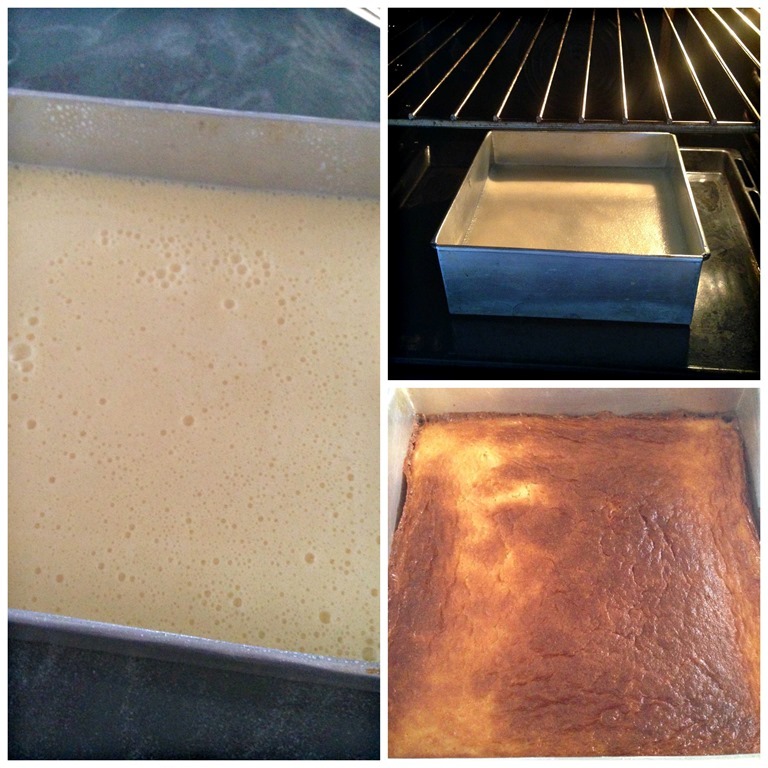 Transfer the batter to the greased square baking tin and bake the cake at 160 degree Celsius for about 15 minutes (bottom heat only) and change the temperature to 175 degree Celsius at top and bottom heat and bake for additional 10 minutes. 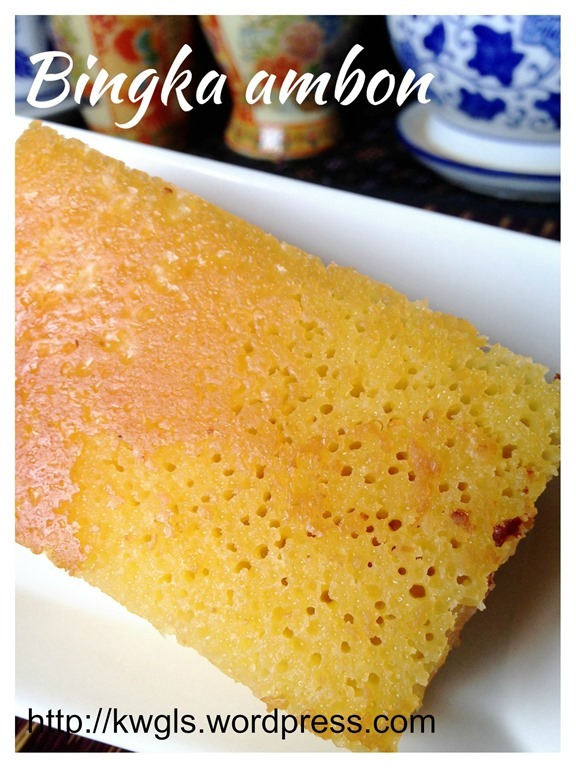 Personally, I found that this recipe is workable because it is very different from the previous recipe that I have tried. The batter is not overly watery. 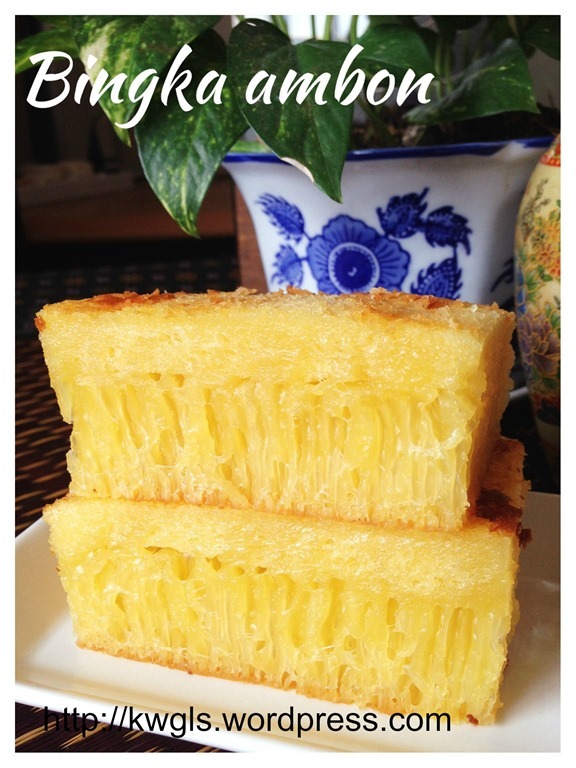 I believed that with the special adjustment of the oven mode, one will be able to get a successful Bingka Ambon. 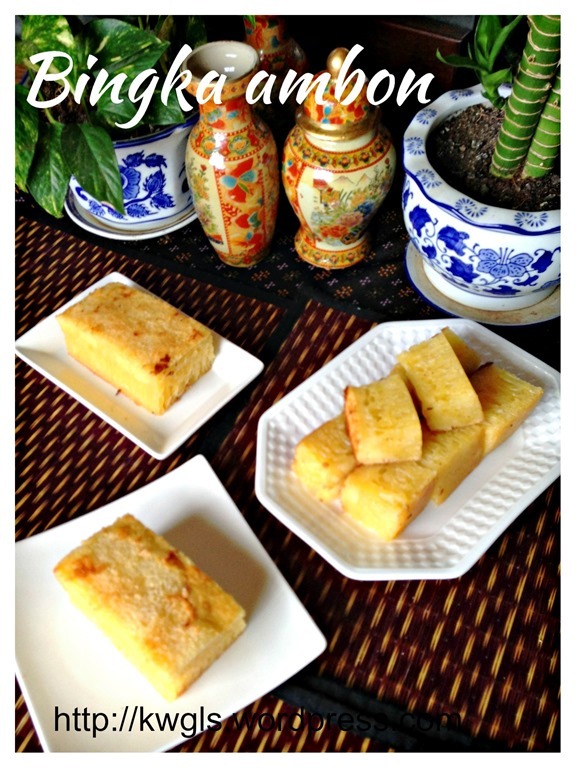 Whether Bingka or Bika, I am equally confused but I will continue to try out this recipe with further modifications. If there is any new discovery, I will update the post. 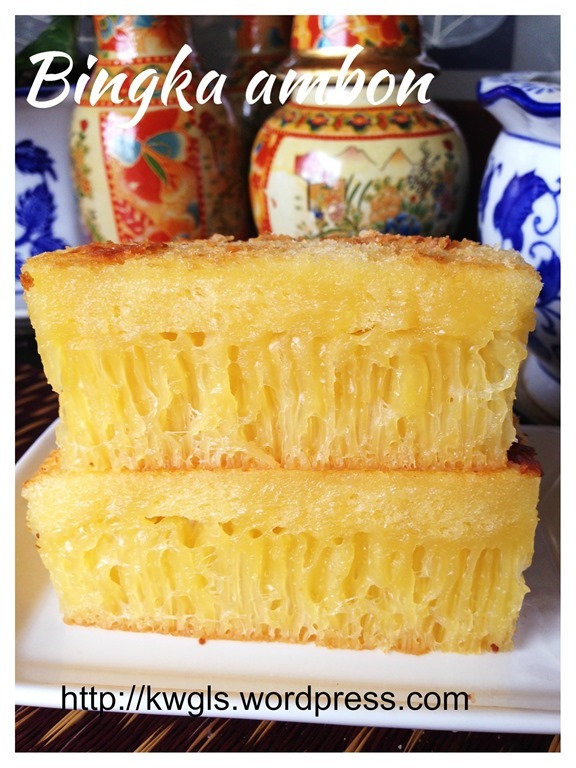 This entry was posted in Chinese and Asian Cakes and Snacks, Food Preparation Series and tagged 8, Bika Ambon, Bingka Ambon, GUAI SHU SHU, Guaishushu, Indonesian Honey Comb Cake, kenneth goh, postaday. Bookmark the permalink. 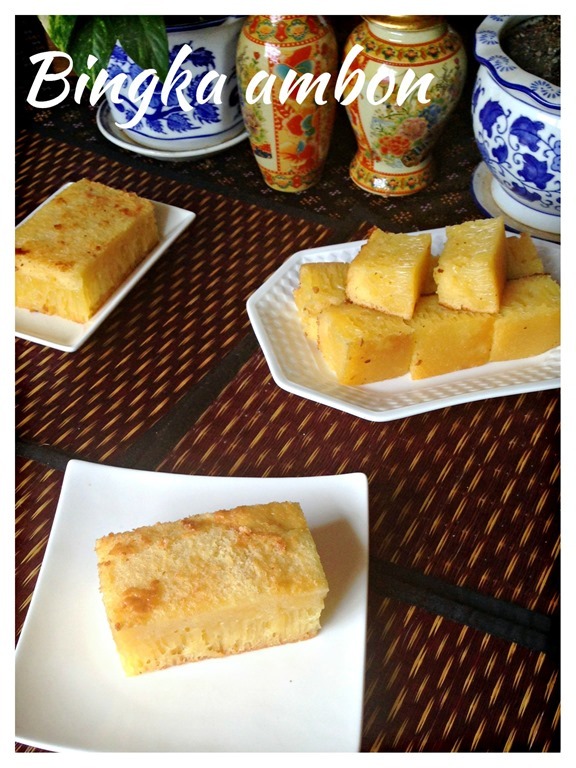 Hi Kenneth, do you know if there is a taste or texture difference when we use sago flour (instead of tapoica flour) for the Kueh Ambon or the taste difference is negligible? Thanks for your thoughts on this:) have a lovely Sunday . I do not believe there is a texture difference. Sorry for the late reply.